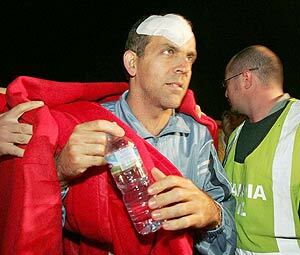 after the caving tragedy on the Canary Islands. Rescue teams have recovered the bodies of six people who apparently suffocated to death while exploring underground caverns on Tenerife this weekend. They were part of a caving expedition which entered the Barranco de Los Cochinillos cavern, in Los Silos, on Saturday. It was made up of two groups, one from the Canaries Astrophysics Institute, and the other, members of the Tenerife Friends of Nature Association. The tragedy seems to have happened when they mistook their route, and became trapped in the Piedra de los Cochinos, a 200 year old man-made gallery where temperatures reached 30 degrees Centigrade, and the volcanic terrain gave off toxic carbon dioxide gases. One by one, they began to lose consciousness. Some regained consciousness two hours later and one of the group managed to make the call for help. Others, however, decided to continue the journey, and entered a gallery which led to a dead end. Rescuers had brought out 24 of the group by Sunday night: six of them remain in hospital recovering from hypothermia, exhaustion and gas inhalation. José Segura, the central government representative on the Canary Islands, made the announcement 24 hours after the group of 30 began their journey underground that 6 of them had lost their lives. Two have so far been identified: a 24 year old Spanish woman, and an Italian man who is studying at the Astrophysics Institute. Reports indicate that the remaining four are all Spanish nationals.